The name may sound seasonal, but The Christmas Gala is committed to helping senior adults in Bucks County year-round. What started as a holiday gala among friends and family has grown into a team of 40 volunteers serving hundreds in the community. In years’ past, Masonic Villages has printed and distributed its Report to the Community. In an effort to “go green,” this year’s report is only available online. Masonic Villages is donating the money saved on production costs to charitable organizations serving seniors across Pennsylvania. A $2,000 donation was made to The Christmas Gala on behalf of the Masonic Village at Warminster. Shown above (l-r): Cheryl Campbell, executive director of The Christmas Gala, Masonic Village resident Kaye Benson and Kelly Weaver, executive director, Masonic Village at Warminster. Recipients are low-income residents, many of whom have no family in the area. 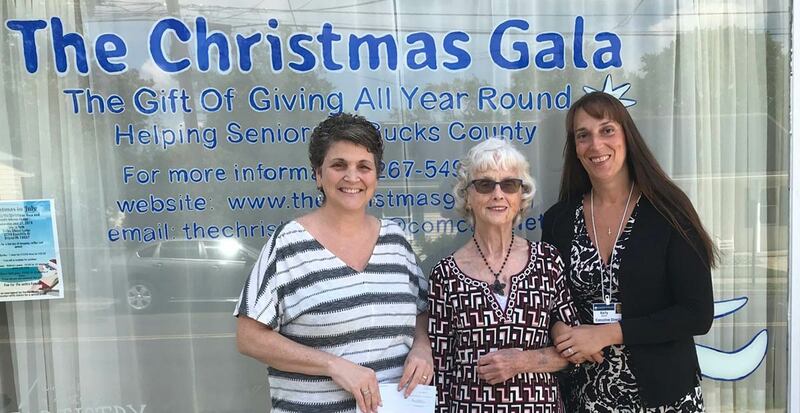 Through the support of social workers, senior centers, individual donations and the hard work of Cheryl and her team of volunteers, the organization serves all of Bucks County and parts of Burlington County in New Jersey. Its programs include the Angel Tree, which works with Meals on Wheels and provides Christmas gifts to homebound seniors who live alone. In 2017, the program distributed 1,100 gifts and 250 care packages and dental supplies. For emergencies, the EPIC program provides help for immediate needs, such as an unpaid electric bill due to an unforeseen illness, a broken heater, roofs in need of repair and medical co-pays. In 2017, 145 clients benefited from more than $43,000 in assistance. The Extra Care and Help for Seniors, or ECHOS, program provided non-medical, skilled, companion/homemaker care, transportation and personal care services for 15 clients last year. Different needs and emergency situations arise every day. The Christmas Gala was recently able to assist a woman in her late 60s who had been ill and in the hospital. Since she was unable to work and make money, she could not afford to pay her rent. Cheryl and her team provided money for her rent and other bills, allowing her to focus on her recovery. In another situation, a man with physical disabilities was recovering from surgery and needed a full-time caregiver, but his apartment needed to be thoroughly cleaned and disinfected to make it livable. The Christmas Gala covered the costs of having his apartment cleaned. Learn more about The Christmas Gala on its website. In 2017, between awarding scholarships to teen volunteers, donating to local emergency service providers, hosting interns and many other efforts, Masonic Villages gave back more than $778,800 in support to the Dallas, Elizabethtown, Lafayette Hill, Sewickley and Warminster, Pa., communities, while also providing charitable care and services worth $48.9 million. For Masonic Villages’ full Report to the Community, visit our website.